There is much to enjoy. Those of you who start reading from the back and work forwards will already have found my reviews of Ian Matthews’ solo re-releases. This is also really a re-release, but it follows so closely upon its original appearance – one we did not review – that I have placed it as a new release. Ian (now reverted to his original Iain) Matthews has had an eclectic and varied career. After the two solo albums he formed the band Plainsong with Andy Roberts (Liverpool Scene) but within a year relocated to Los Angeles, remaining in the US for 28 years, recording a further fifteen solo albums, several more with Plainsong as well as linking up with David Surkamp in Hi-Fi (their ‘Complete Collection’ being reviewed back in Fireworks #51, click HERE to read the review on Rocktopia). Now living in Holland he has reactivated the Matthews’ Southern Comfort name for this release. 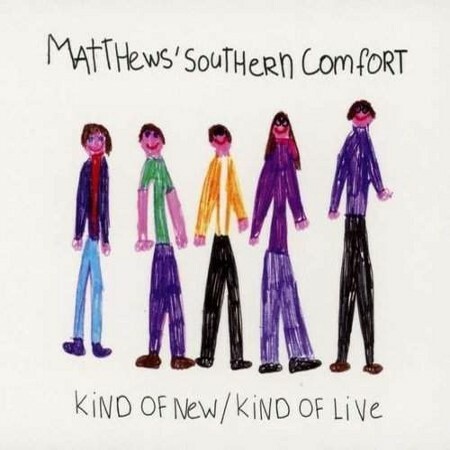 It was partially recorded in 2005 but not completed until Matthews’ muse returned and he added his vocals in 2009. The second disc – recorded in Holland live in the studio in 2010 – of this attractively slipcased release has four songs in common with ‘Kind Of New’, but note that only Bart van Baartmans features in both incarnations of Matthews’ SC ensemble for these recordings. Overall this is a very gentle, laid back mostly acoustic work. For the first time on a MSC record, ‘Kind Of New’ extensively features female vocals – either solo or in duet from Terri Binion who also wrote five of the songs, while on ‘Kind Of Live’ female vocals are provided by Elly Kellner. I’m not certain about her approach on the somewhat bluesy ‘These Days’ but elsewhere – as on ‘Perfect Love’ and ‘Seven Hours’ her sweet singing is really wonderful. Those of you familiar with the original MSC, will recognise the re-visited songs from their three albums: ‘Woodstock’, ‘Blood Red Roses’ and ‘Road To Ronderlin’. All are interesting re-workings; ‘Woodstock’ takes some getting used to, while ‘Blood Red Roses’ and ‘Road To Ronderlin’ jointly sung by Matthews and Binion are complete triumphs! If folk rock infused with country rock, complete with heartfelt performances, wonderful harmonies and great songs such as opener ‘Letting The Mad Dogs’ appeals, then do investigate further. You will find that ‘Kingfish’ is rather a clunker, but elsewhere there is much to enjoy.